What adjective comes to your mind when you think of an island richly endowed with natural attractions such as waterfalls, hot and cold springs, and white sand beaches? Dubbed as the “Island Born of Fire”, it’s name alone sounds enchanting. [kami’gin] Camiguin! My interest to visit the island began after I saw video clips showing the beauty of the island from the Filipino movie of the same title which was shown in the late 1990’s. I got fired up even more after two very good friends got married and spent their honeymoon there. Back then, however, traveling for me was simply a pipe dream. I could only mutter “Someday” to myself, followed by a big, heavy sigh of frustration. I hadn’t had a clue that “that someday” would happen after almost 20 years. Camiguin, Finally. 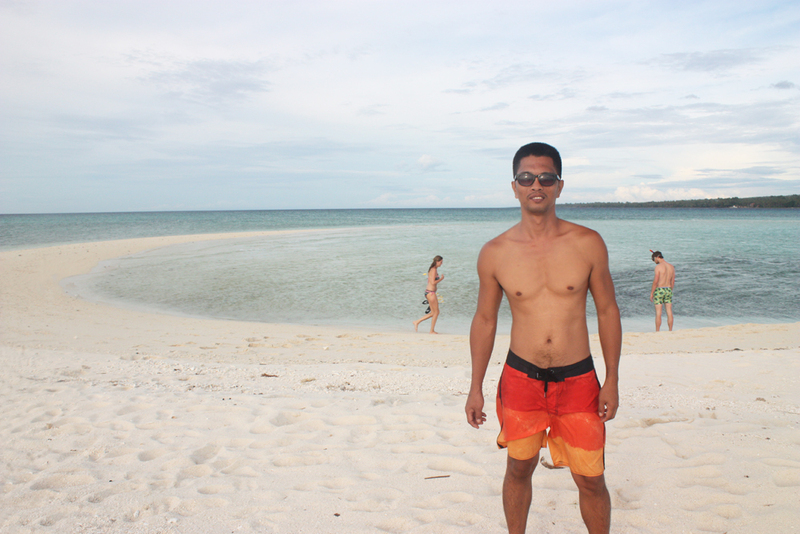 We got to Camiguin via an overnight ferry from Cebu. Our travel time took longer than usual, we arrived at Balbagon port 3 hours behind schedule. Jojo Ocular (+639059566288), a highly-recommended tour guide in the island and whom we contacted earlier to assist us during the entire trip, had been waiting outside to pick us up. We hopped on his habal-habal (motorcycle)and asked him to bring us directly to the resort. We agreed to re-schedule the tour the next day. 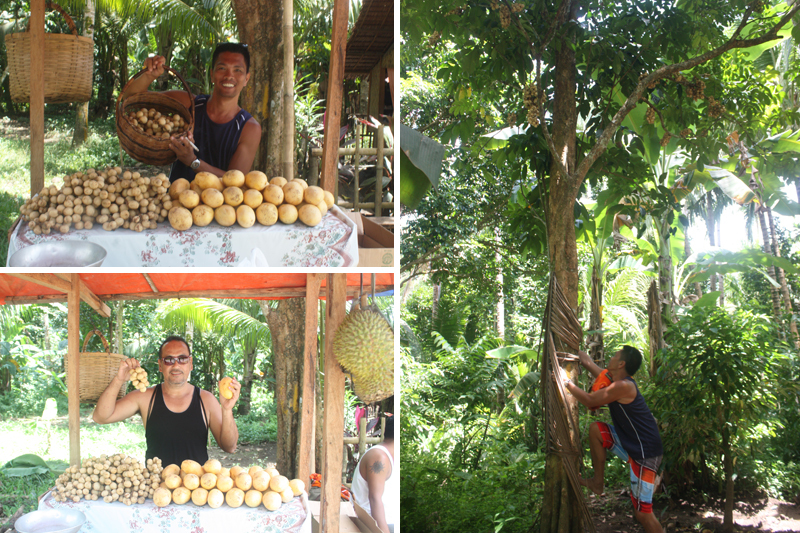 Before he left, he suggested we hire a boat and go to White Island later that afternoon, when the tide is low. And that’s what we did. 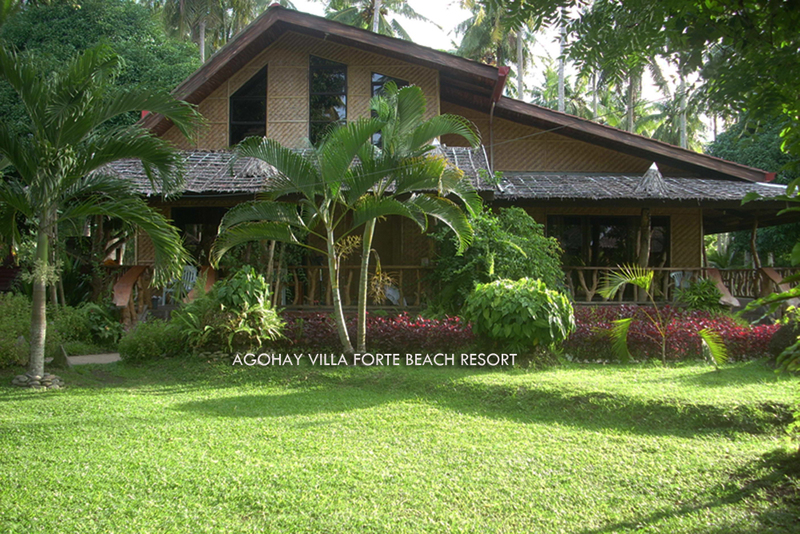 At 4PM, the resort’s caretaker knocked on our room to tell us that the boatman whom he contacted had arrived. From the resort, it took us approximately 10 minutes to get to White island. The island is truly a gem. It is as beautiful as imagined it to be. It is technically a sandbar, devoid of any type of vegetation and is composed solely of pure white sand. The clear shallow waters surrounding the sandbar is great for swimming and snorkeling. We stayed here till sunset and had so much fun crossing the shallow waters to get from one sandy part to another, taking selfie pics (lots 🙂 ), and watching fellow tourists simply having a great time. Jojo came back to the resort the next morning. We wanted a relaxed tour so we handed him our prepared list of tourists spots in the island, and simply let him take us to these places in the order he thought best. 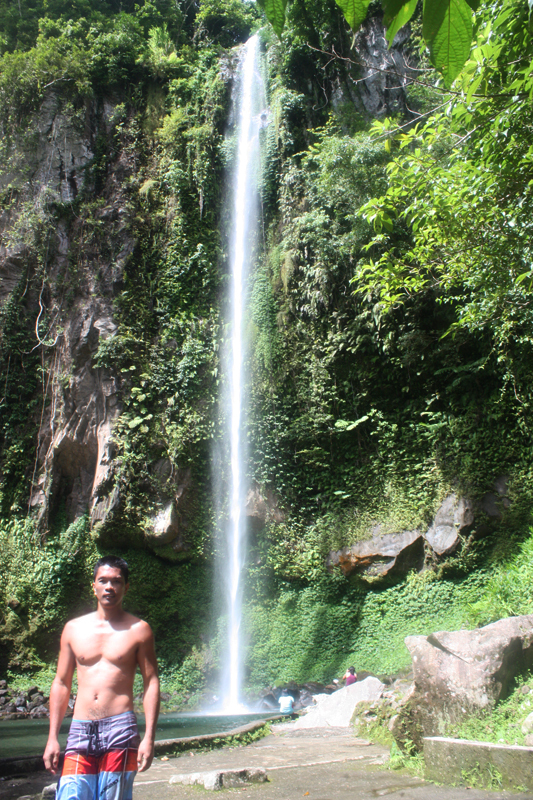 He brought us to Katibawasan falls first, one of the most popular destination in the island. The entire area has been developed as a nature park. A Php10-entrance fee per head is collected at the gate. 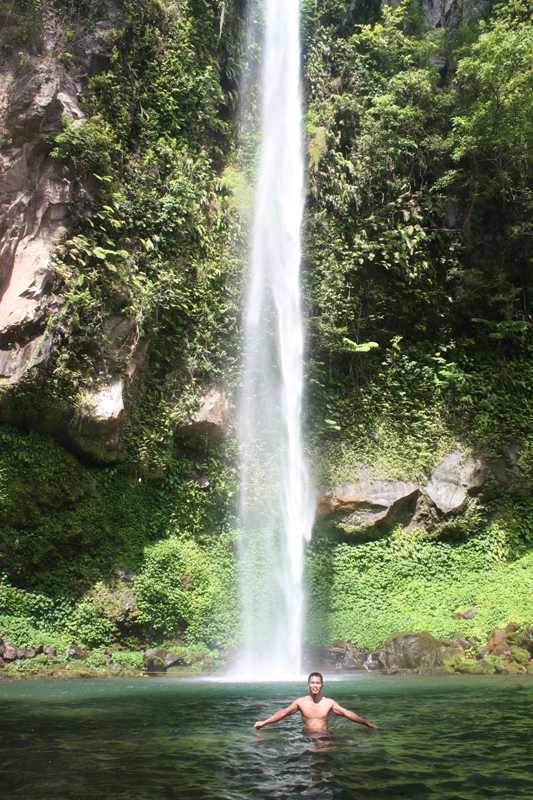 The waterfall is towering at at 250 feet, but it wasn’t big and wide and the water falling from it was weak. 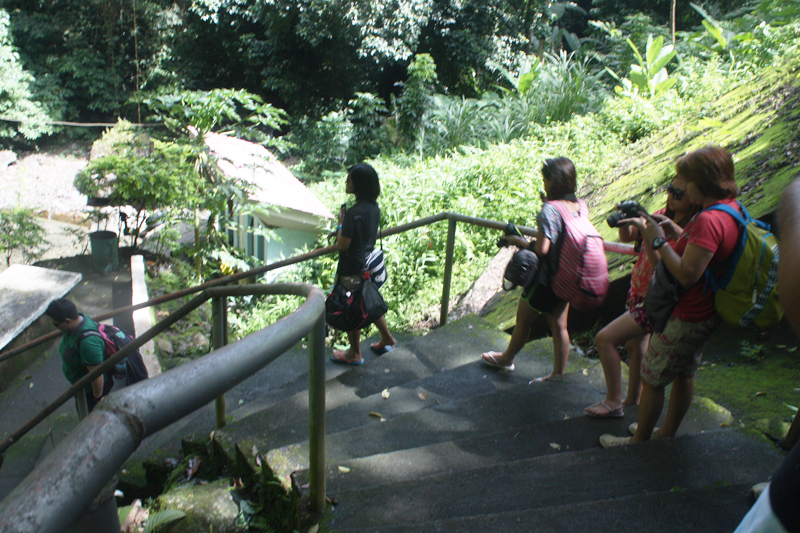 Cemented stairs with hand rails serve as easy access to reach the natural pool at the bottom of the waterfall. At 9:00 in the morning, there weren’t a lot of tourists yet. The water was chilly but that did not stop us from swimming. I was shivering the first few minutes, but I kept going. After an hour or so, we headed to Bura Soda Pool. Entrance fee is Php20.00. I thought it looked like an ordinary commercial pool. But I found out later that there was something special about it that’s invisible to the naked eye 🙂 I needed to taste it to know what it was. Now, you’re curious, I could tell. That’s exactly how I felt. The pool is actually filled with natural streaming soda water! You know those flavored water you buy at 7-Eleven or Mini-stop? Imagine, swimming in a pool filled with those. The water flows down from a volcanic spring nearby. Of course you wouldn’t drink from the swimming pool, though you can’t help but taste it while swimming 🙂 There is a faucet specifically dedicated to safe drinking water. I saw several tourists filled up their empty plastic bottles with water before they left. 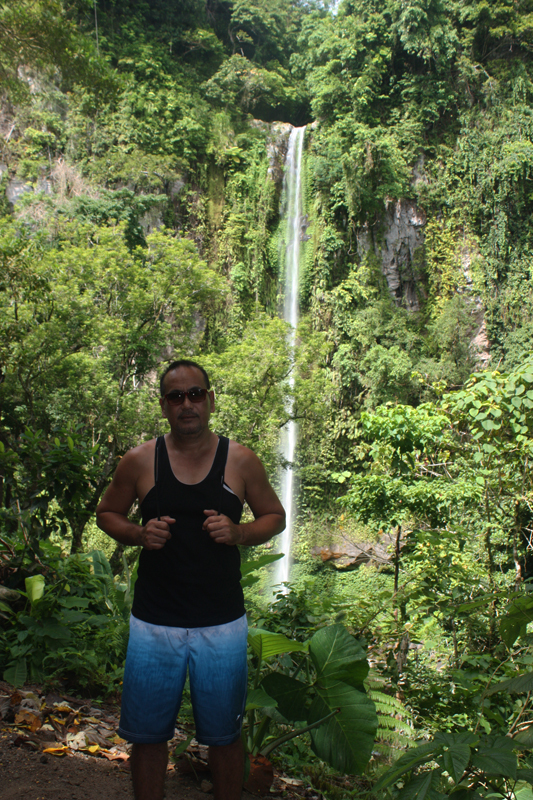 Our next stop was Tuasan Falls. 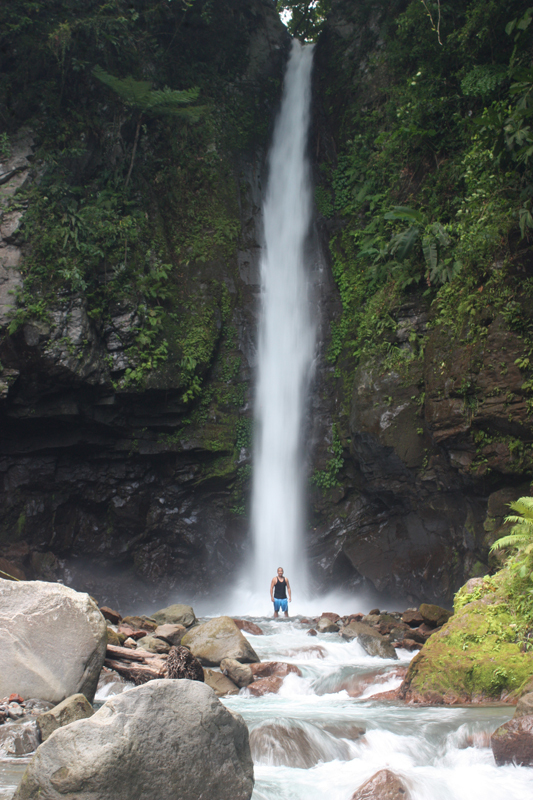 Initially, we thought that from the jump off point, we would need to trek for at least 30 minutes to get there. 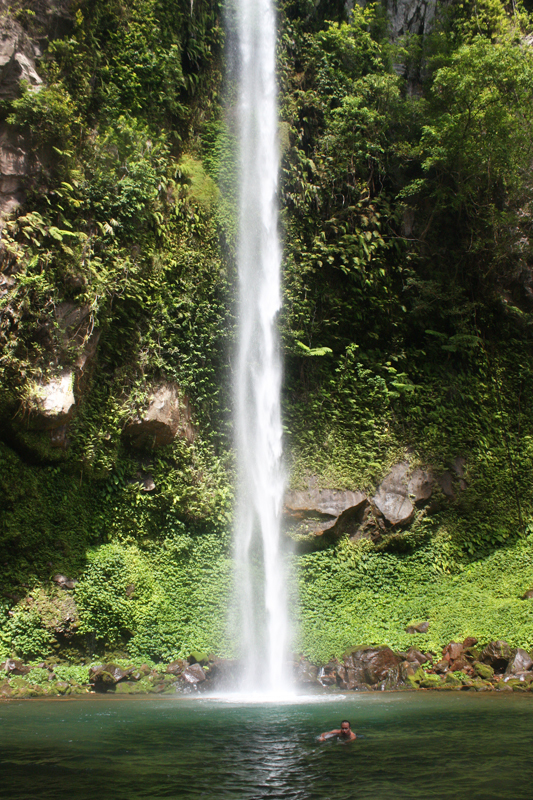 But to our delight, and to our guide’s surprise, there has been a major improvement in the road construction near the spot, thereby providing a closer, easier access to Tuasan falls. 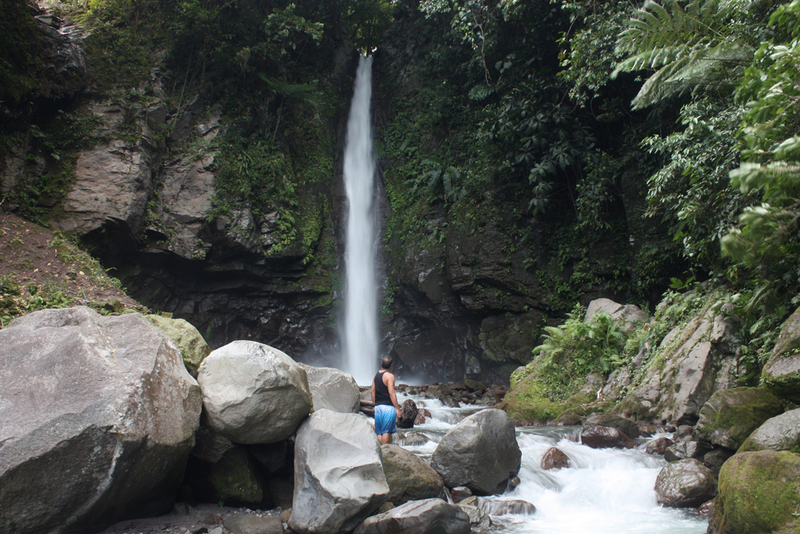 From where the motorcycle stopped, it was a short 10- minute walk to the base of the falls. 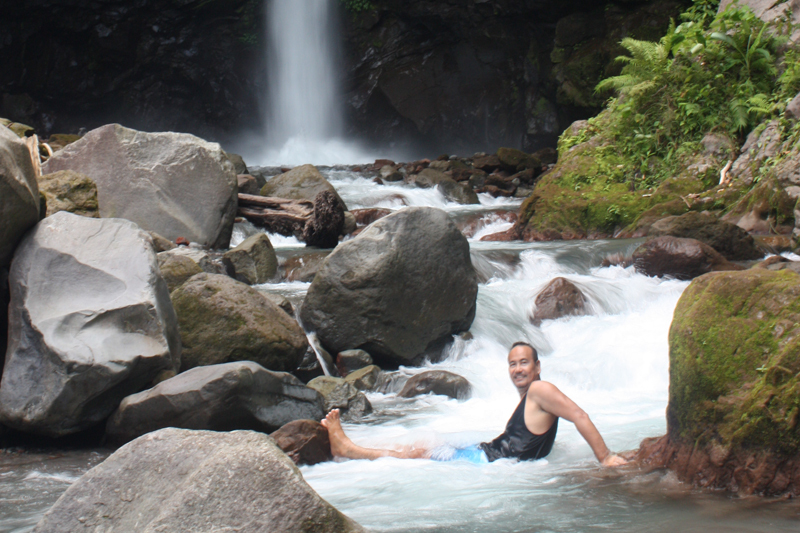 Tuasan Falls is still in it’s rugged, unspoiled state. There are no infrastructures of any kind near the area. No cottages, no shops, no vendors. There weren’t any other tourists too during our visit. It was just us and pure nature. We stayed here longer than we intended to. We were completely enthralled by the natural beauty around us. We had so much fun, it was quite difficult for us to leave. We left only when our stomachs started to grumble. Our lunch in a roadside carinderia was quick and forgettable. The sunken cemetery was just nearby so that’s where we went next. While this spot is famous as a unique diving destination, we did not go there to dive. We only wanted to see one of the most photographed spots in the island. 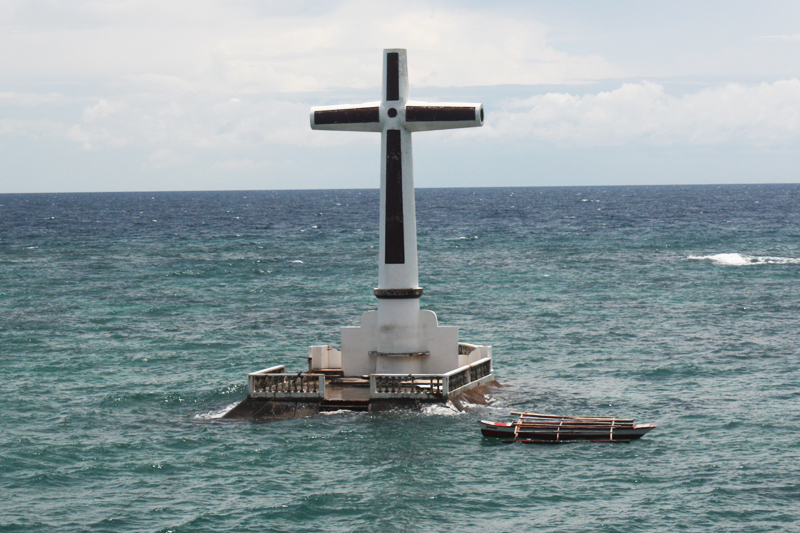 There is no entrance fee but for those who wish to go to the cross itself, they need to pay a Php20 per head for a boat ride. The place is great for photography during sunset. After taking a few “I was here” photos, we bought some ref magnets in one of the shops, then headed to the last destination on our list. 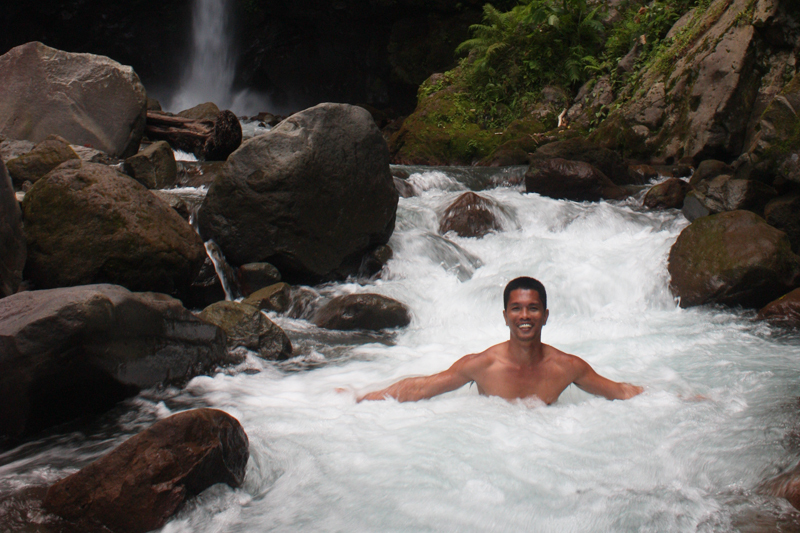 We thought a dip in the warm water of Ardent Hot Spring was the best way to cap off the tour. And it was. We paid P30 entrance fee and headed straight to the spring. The water wasn’t too hot. It was lukewarm, which was the perfect temperature for me, personally. It was soothing and relaxing. 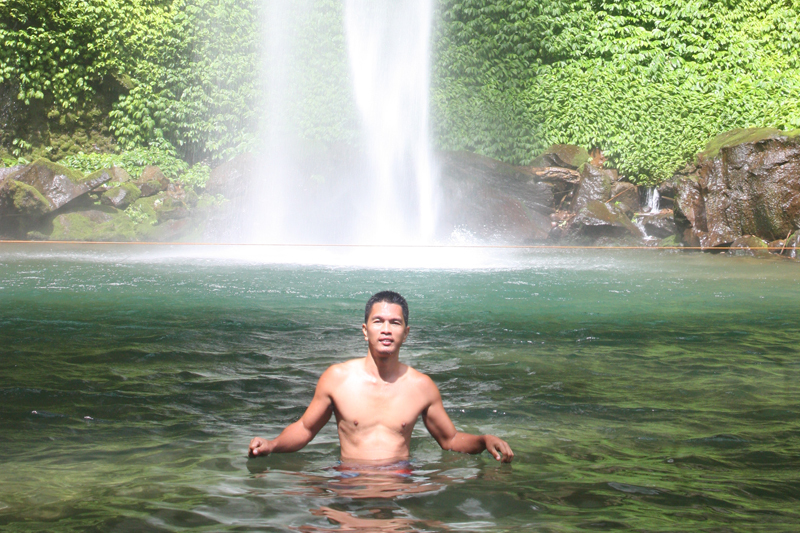 The place looked and felt magical with its hot spring water flowing over a series of cascades and pools underneath a lush green canopy of leaves. We stayed here for a while, simply soaking in the water and enjoying the view. We eventually left after a couple of hours and went back to the resort to prepare for our overnight boat trip back to Cebu at 8PM. As I looked at the pictures later that night, I thought, what a great weekend that was. 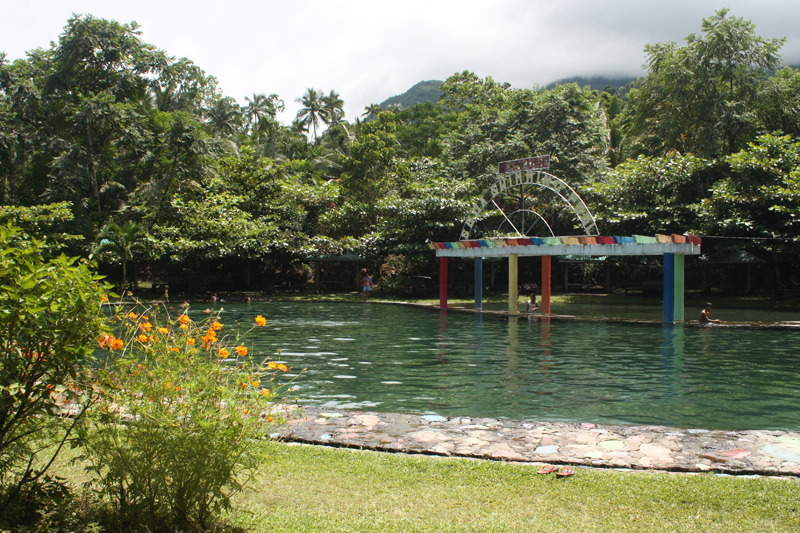 Camiguin may be a small island but it surely has a lot to offer to delight it’s visitors. It’s a great place for a relaxing weekend getaway. I’m sure my friends were so glad to have chosen the island as their honeymoon destination years ago. 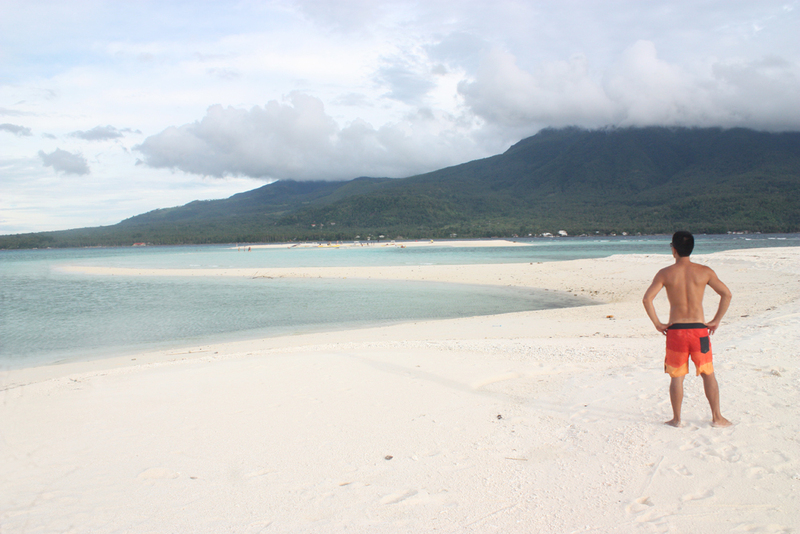 Camiguin surely is as romantic as it sounds. 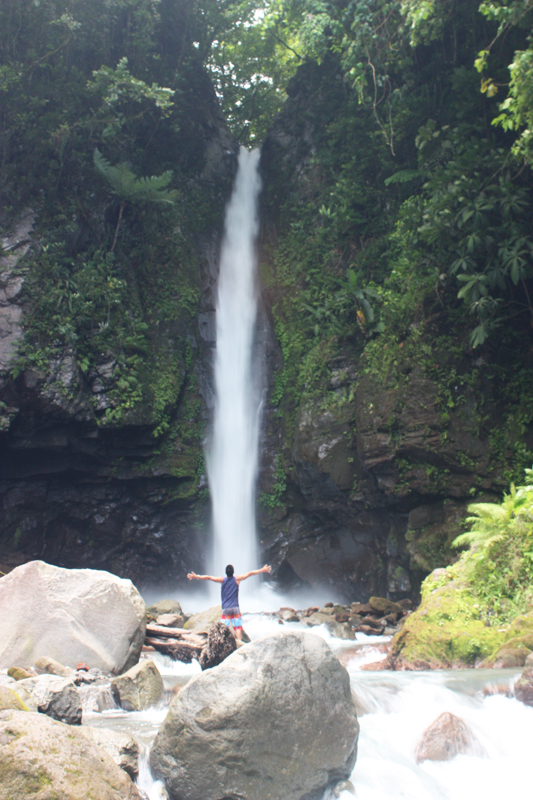 Travel Tip: If you’re preparing an itinerary for a one day or two-day tour in Camiguin, all you need to do is to make a list of the places you wish to visit in Camiguin and let your guide take you to these destinations. 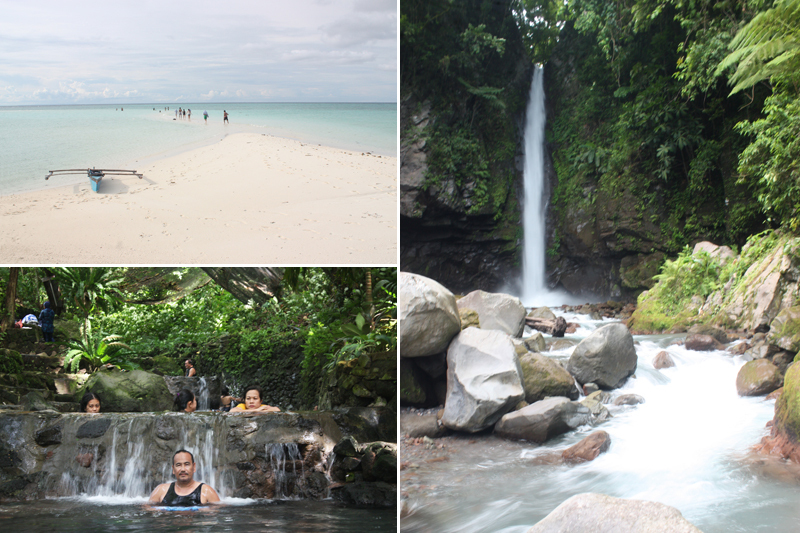 Aside from those we visited, which we thought were the best spots in the island, other places worth visiting in Camiguin are Mantigue island, Sto. 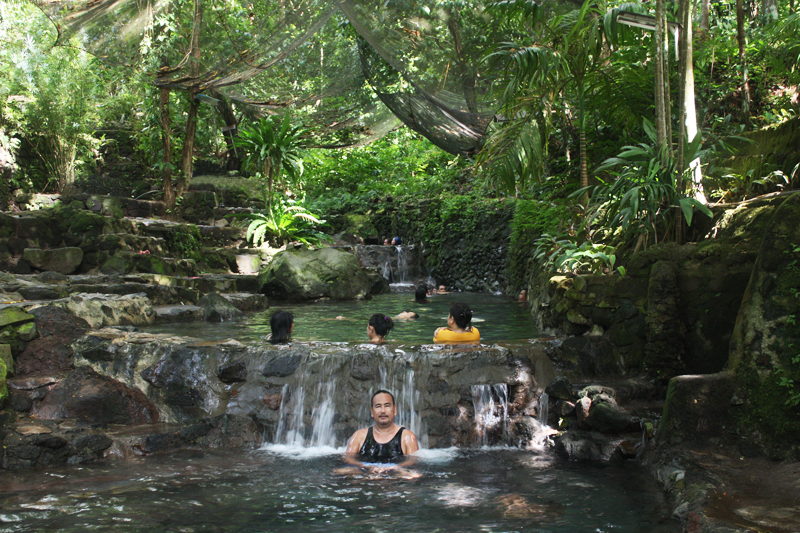 Nino Cold Spring, Old Guiob Church Ruins, Old Volcano Trail, and the Giant Clam Sanctuary. how much did you pay all in all for the habal habal?